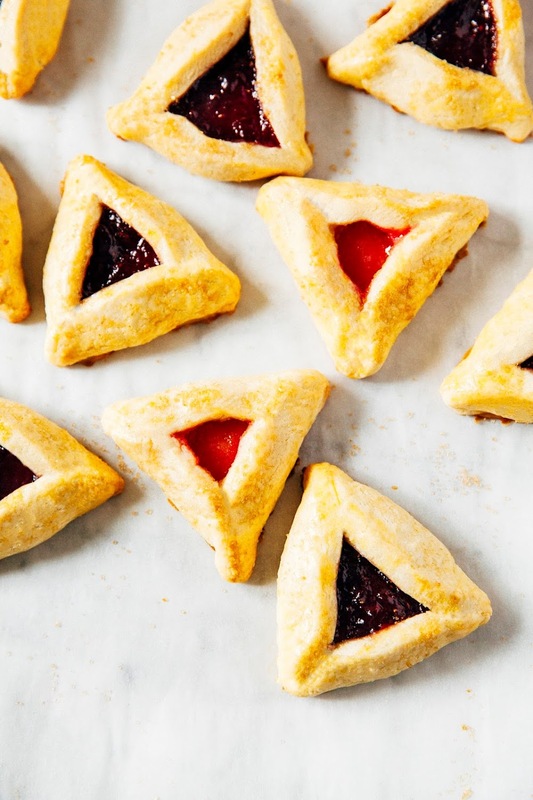 Confession time: the last time I had a hamantaschen cookie, I was probably around seven years old and thought they were the lamest things ever. The ones I had were shelf-stable and came from a tin one of my Jewish relatives had bought at the grocery store. The cookies were dry and crumbly; the filling in the middle was something sad and un-kid friendly, like poppy seed with prune preserves. If you're unfamiliar with hamantaschen, they're basically the Jewish equivalent of a linzer cookie. 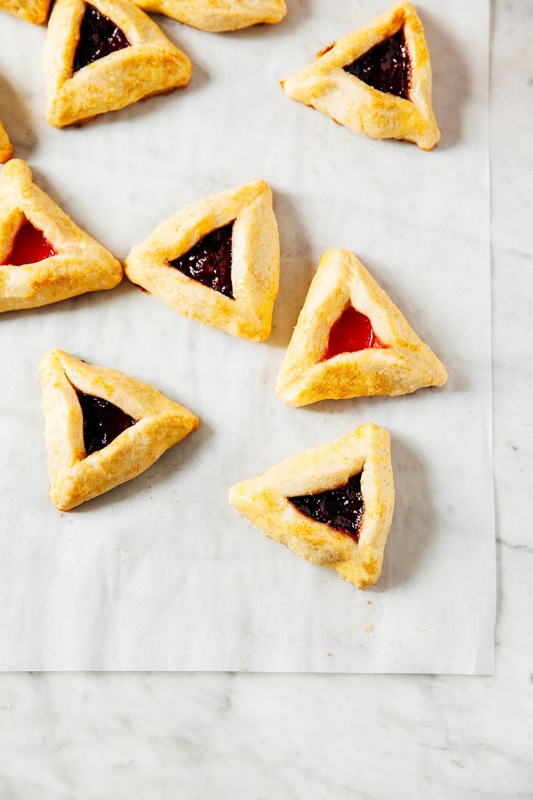 Basically a shortbread-like cookie with some kind of jam. 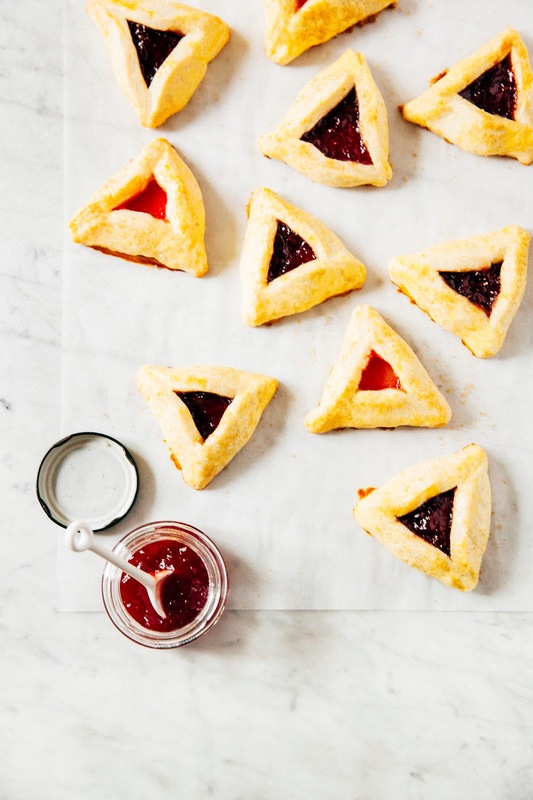 Except instead of the traditional round, sandwich cookie shape, hamantaschen come in triangular shapes in honor of the Jewish holiday of Purim, a.k.a. Jewish Mardi Gras. I kid you not. 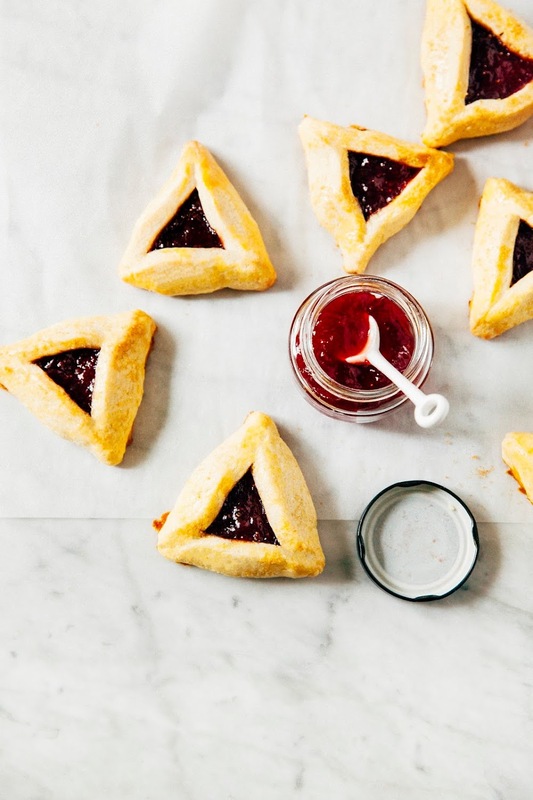 Purim is Jewish Mardi Gras. It's a thing. 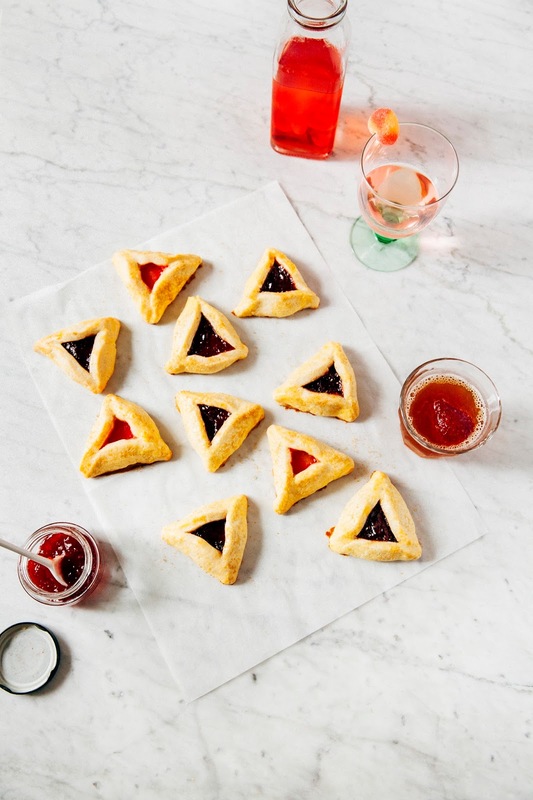 The origin of Purim is a little long and complicated, but the short story is that some evil dude named Haman wanted to kill all the Jews in his empire, his plans were foiled, and as a result, all Jewish folks partied hard to celebrate and continue to do so today. 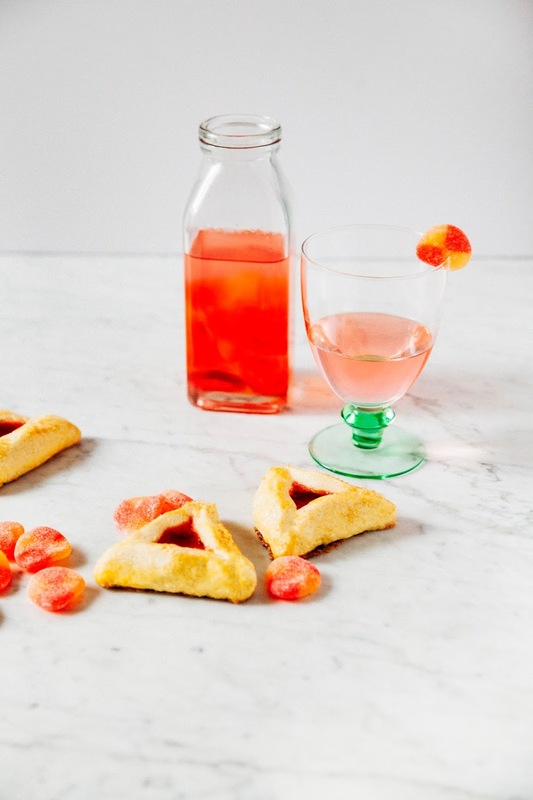 As a Jewish person, you're obligated to get drunk on Purim. It's religion. It's god's word. 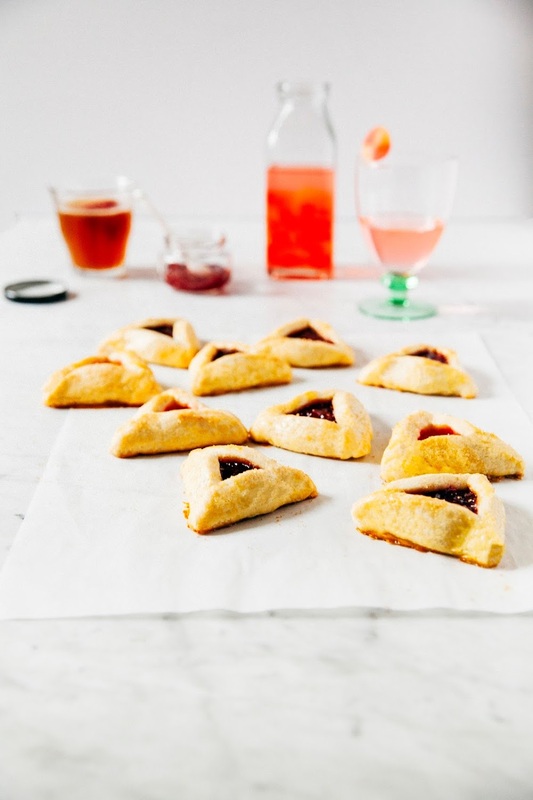 And before you get all up in arms about me being a heathen, do a Google search for "Purim" and see how many results come up for "Do I have to get drunk on Purim?" and "Is it Mitzvah to get drunk on Purim?" 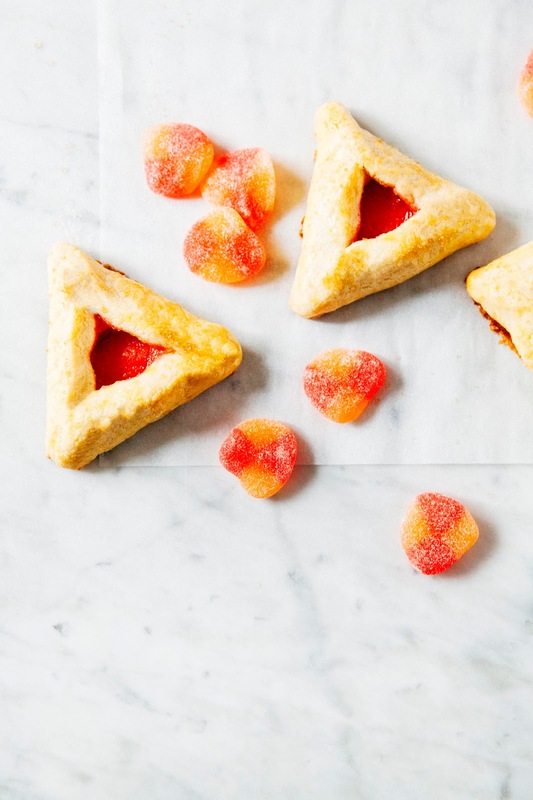 So to get in the spirit of the holiday, I've eschewed traditional hamantaschen fillings for boozy ones like jam made from fresh strawberries drenched in hoppy IPA beer and Haribo peach gummies drenched in vodka. Yeah, you read that right. Haribo peach gummies drenched in vodka. Because it turns out when you bake a gummy peach in the oven, it melts down and basically becomes a stickier kind of jam. 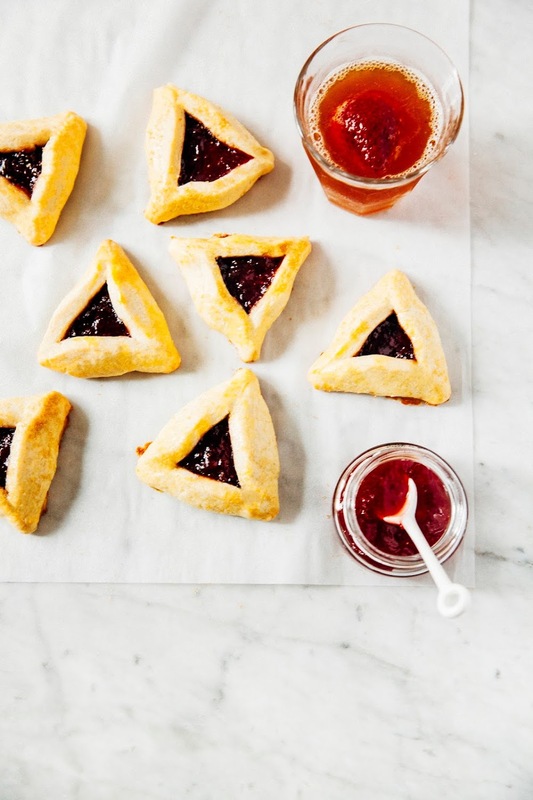 As for the cookie base itself, I used this hamantaschen recipe from Bon Appetit magazine. The recipe produced wonderfully buttery, loose crumb — a far departure from those lame ones I had when I was little. Fresh from the oven and with jam in the middle, each cookie reminded me of a scone. Well, a boozy one, at least. Prepare your fillings in advance! You can make the strawberry IPA jam up to two weeks in advance — just be sure to keep it in an airtight container in the fridge. The gummy peaches, however, work best if they're soaked in vodka for an hour and not much longer. Too long and they become too gooey and sluglike to work with. The dough can be a little bit of a pain to work with — it needs to have rested and chilled in the fridge for a few hours before you can roll it out. However, if you roll it out when it's too cold, the dough has a tendency to crack when you fold the cookies. AND THEN if you wait too long and the dough is too warm, they won't keep their shape in the oven! It's best to make the dough the day before you want to make the cookies, and then take it out of the fridge an hour before you roll it. Once you've rolled it, it's best to stick the cookies back in the fridge for around 30 minutes or so to allow the dough to firm up again. Sorry! It's worth it, I promise. Okay, the strawberry jam is a little bit finnicky too. Depending on how much alcohol your IPA had, the jam might not have thickened enough and will still be too runny for the cookies. When you're ready to use the jam, check the consistency. If this is the case, stir 1 teaspoon unflavored power gelatin into the chilled mixture and let sit for at least 15 minutes. The gelatin should thicken the mixture — but you can't do this in advance, or the gelatin will overbloom. You can also avoid this issue entirely by using an IPA with lower alcohol content. Combine 6 ounces hulled and diced fresh strawberries, 1 cup IPA beer, 2 tablespoons granulated sugar, and fresh zest from 1 medium lemon. Let sit at room temperature for 4 hours, or cover and refrigerate overnight. Transfer the mixture to a medium, heavy-bottomed sauce pot over medium-high heat. Cook the mixture until it begins to boil and foam, making sure to stir the pot to prevent the mixture from boiling over. Once the mixture reaches a boil, lower the heat to medium-low and continue cooking until most of the liquid has evaporated and the jam is thick enough to coat the back of a spoon, around 30 minutes. Transfer to a wire rack to cool to room temperature completely — the jam will thicken slightly as it cools. Transfer to a glass jar with a lid and refrigerate overnight. In a medium bowl, whisk together 4 cups all-purpose flour, 1 1/2 teaspoons baking powder, and 3/4 teaspoon kosher salt until well combined. Set aside. In a freestanding electric mixer fitted with a paddle attachment, combine 1 cup unsalted butter and 1 cup granulated sugar. Beat on medium-high speed until pale and fluffy, at least 5 minutes. Once the mixture has doubled in volume, reduce the mixer speed to its lowest setting and add 2 large eggs, one at a time, only adding the next egg when the first is completely incorporated. Reserve the last egg for the cookie egg wash.
Gradually add the dry ingredients (from the 1st step). 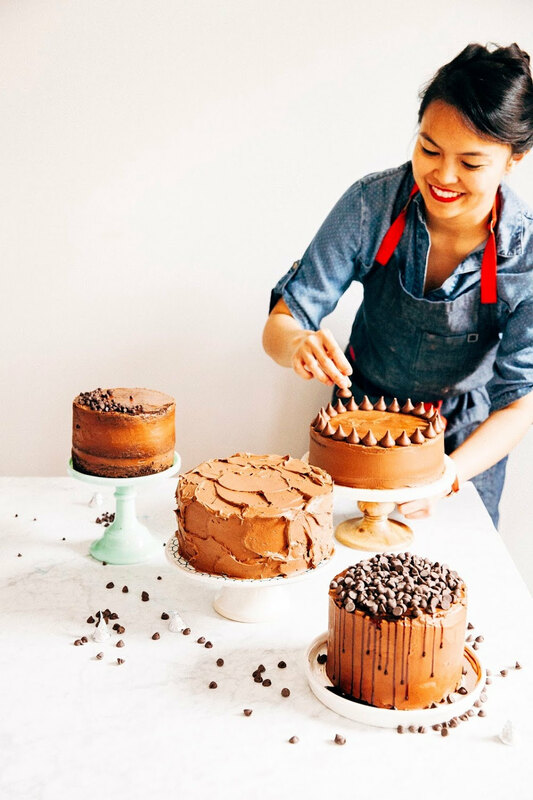 Continue mixing just until the dough comes together. Divide the dough in half and pat into two disks. Cover with plastic wrap and chill for at least 2 hours, preferably overnight. When you're ready to roll out and form the cookies, remove 1 disk of dough from the fridge and let sit at room temperature until softened slightly, at least 30 minutes to 1 hour. Center a rack in the oven and preheat to 350 (F) and prepare 2 sheet pans by lining with parchment paper. Set aside. Next, prepare your fillings. In a small jar with a lid, combine 12 Haribo gummy peaches and 1/3 cup vodka. Seal the jar tightly and give the jar a good shake; set aside. Check the consistency of your strawberry IPA jam — depending on how much alcohol your IPA had, the jam might not have thickened enough and will still be too runny for the cookies. If this is the case, stir 1 teaspoon unflavored powder gelatin into the chilled mixture and let sit for at least 15 minutes. The gelatin should thicken the mixture. At this point, your dough should be good to go. Lightly flour a surface and roll out the disk to a slab about 1/4-inch thick. 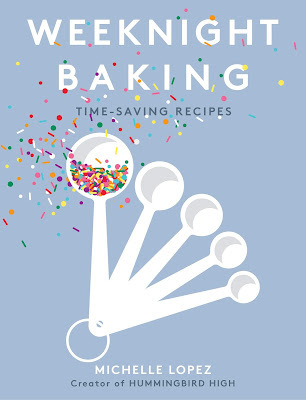 Cut out 3 1/2-inch rounds with your cookie cutter and use an offset spatula to transfer the rounds to the sheet pans, leaving about 1 1/2 inches of space between each one. Gather up scraps, re-roll, and cut out any additional rounds. Working a few at a time, place 1 teaspoon of strawberry IPA jam OR 1 vodka infused gummy peach in the center. Fold sides of each circle up to make a triangle, pinching points gently to seal and leaving about a 1-inch surface of filling exposed. Transfer to the refrigerator to chill while you repeat the process with the second dough disk. When all the cookies from the second disk have been shaped, transfer to the refrigerator to chill. Remove the first tray and whisk together 1 large egg and 1 teaspoon water in a small bowl. Use a pastry brush to brush the sides of the chilled cookies with the egg wash; sprinkle 1 tablespoon of demerara sugar over the eggs. Transfer to the preheated oven and bake the cookies until golden brown, around 20 to 24 minutes. Transfer to a wire rack to cool completely. Repeat the egg wash and baking process with the second tray of chilled cookie dough.